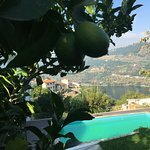 Really nice area of the Douro Valley, beautiful, clean house with really nice garden and swimming pool, great hospitality and georgeous panorama of the river. Breakfast with local products was really tasty. Highly recommend! Get quick answers from Quintinha de Mirao staff and past guests.